Cut an “x” on the bottom of each Kumato® Brand Tomatoes and drop in boiling water for 30 seconds. Drain. Run tomatoes under cold water and drain again. Peel off skin. Coarsely chop the tomatoes and place them in large bowl of a food processor. Pulse until the tomatoes are puréed and mixture is very smooth, 2 to 3 minutes. Add remaining ingredients and pulse several times just to mince the mint. Do not purée mint. Taste, adding more simple syrup, mint, or vodka if desired. Pour mixture into freezer safe bowl. Stir every few hours until mixture begins to harden, about 6 to 8 hours. 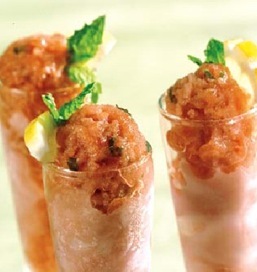 When semi-solid, use an ice cream scoop to mold balls of frozen Granita, serving in small shot glasses, small goblets, or small bowls. If desired, garnish the rims with a few slices of fresh lemon and mint leaves. Place 1 cup sugar and 1 cup water in a medium saucepan. Stir mixture over very low heat, dissolving the sugar crystals. Wipe down the sides of the pan with a wet pastry brush, removing any sugar crystals. Bring syrup to a gentle boil, cover, and simmer over low heat 2 to 3 minutes. Cool. If time does not permit making the simple syrup, substitute this ingredient with corn syrup. Mint gives a sweeter taste profile. Try basil for a savory flavor. Add a dash of Tabasco sauce or chili sauce to taste, if a sweet-hot flavor is desired. The mixture can be placed in an ice cream maker and frozen per the directions given to freeze a sorbet. Serve this sorbet style refresher as a first course, palette cleanser, or with tangy lemon bars as a unique dessert.